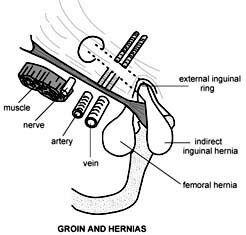 The area below the groin is often numbed with local anaesthetic to cut down the pain you may experience when you wake up. However, it is also possible to have the area below the groin numbed with a local anaesthetic and have the whole operation under local anaesthetic. In this case, you will be awake during the operation and you will feel that something is being done in the area of the operation but you will not feel pain. The operation can be done under local anaesthetic when the hernia is relatively small and your general medical condition does not allow you to tolerate the stress of a general anaesthetic.